In How to Build your Wardrobe Part I we discussed why a man’s clothing is important, broke men up into four groups, and then listed the clothing they would need. In How to Build your Wardrobe Part II we will give you 5 general wardrobe building guidelines and expand on the clothing checklists by discussing in detail many of the items we listed in Part I. Did we miss something? Let us know in the comments! Every man should own at least one suit or equivalent garment in accordance with his heritage. It should be pressed, clean, and ready to go at a moment’s notice. I have a client who works as a computer programmer; although he wears the shirts and trousers we made for him daily, he rarely wears his custom suit as his Microsoft office has a relaxed dress code. Two years ago he had the opportunity to attend a dinner with Bill Gates; he was given 6 hours notice and it was at one of the fanciest hotels in town. When opportunity presented itself, he was prepared and seized it; the sad part is many of his colleagues missed the chance because they didn’t even own a jacket. If you own only one suit, ensure 1) it fits, 2) its dark in color, and 3) its timeless in style. To ensure proper fit, first learn what it is and then find a tailor who can alter your suit. Dark colors are important as they are the most formal and are more versatile than lighter shades. And by timeless style, I mean you should be weary of trends like skinny or overly thick lapels, suits with more than 3 buttons, or with signature style aspects that look good to you today but will not stand the test of time (that dragon embroidery on the shoulder is a bit too much). Most men look sharp in a charcoal grey, single breasted, 2 or 3 button jacket with double vents and 3 pockets (2 side flap, one left breast). Your trousers should be made from the same fabric as the suit and if pleated have a cuff or if flat fronted, have none. Other fabrics you should consider for your core suits are medium grey and navy blue solids, grey, charcoal grey, and navy semi-solids, and black if you have very dark hair and medium to dark complected skin. Try to purchase a suit made from 100% wool, although price sensitive men can find blends that have an excellent hand and breathe just fine under limited use. Early on in your wardrobe building journey you should avoid memorable patterns (if people remember it, you can’t wear it later in the week with a different shirt) and double breasted suits (not flexible, hard to dress down, save for a 5th suit). The core dress shirts in a man’s wardrobe should fit him and be simple in design. The first three dress shirts in your wardrobe should be solid in color (white or a shade of blue, the darker the less formal). When looking at style, look for point collars and cuffs that fit the image you are trying to present. I love French cuffs, but for most men they are not a style they’ll use enough in their first set of shirts to justify their purchase. Instead, keep it simple with single barrel cuffs. As for fit, ensure the shoulders and neck are as close to perfect as you can find. Remember that every brand has a different set of models they use to design their clothing’s sizes, so a medium in one brand does not mean you’ll have the same fit in another. And if you have to compromise, purchase a larger fit. Sleeves can be shortened and stomach fabric can be tucked; making a shirt bigger though is not an option. Once you start to move past three dress shirts, you should consider semi-solids, stripes, and checks. The key here is to remember that the plain fabrics are more formal while the fabrics with complicated patterns are less so; also for interchangeability purposes you’ll want to ensure your base collection of dress shirts are devoid of features that make them too memorable. As for patterns, pick and choose based off of which style best compliments your body type. Point collars, medium spread collars, and regular business collars are all solid options for 80% of the population – if you have a round or extremely thin face, you’ll want to choose a collar that balances your facial features. On cuffs, single or two button barrel cuffs should be on the majority of your shirts although you could substitute them for French cuffs if that’s your style. Finally, avoid dress shirts made from fabrics with more than 50% man-made fiber; try to find 100% cotton and avoid silk unless you can afford high dry cleaning bills. The first pair of dress shoes a man owns should be black in color; the second pair can be either black or brown, with the determining factor being the color of the suits in his wardrobe. Black is more formal and less interesting but more versatile. 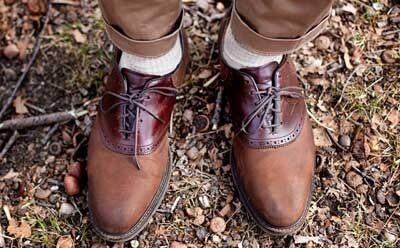 Dark brown shoes, assuming their style matches, can be worn with any outfit except black tie. As to style, look to own at least one pair of plain or cap toe oxfords, and a pair of slip-ons for when you travel. Slip-on styles such as Chelsea boots and monk straps are great for moving through airport security with ease, although they are less formal than their laced brethren. The total number of dress shoes a man should own depends on his needs, but generally speaking he should have at least 3 to 4 pairs that he can rotate through. Rotation is important because while your shoes rest with cedar shoe trees inserted, the wood draws out inner moisture and reshapes the leather which will lengthen the life off all of your shoes considerably. And always brush away dirt after every wear and shine and polish when needed or after wearing them 3 times. If you live in an areas with heavy snow and rain learn how to weatherproof your shoes. Finally, avoid attention grabbing colors and shoes made from materials that require heavy maintenance and are limited as to when you can wear them. Although blue suede shoes make for a good song, they are not for rough winters where salt and water can quickly cause irreparable damage. Also avoid footwear manufactured with extreme square toes or made from shoddy leather and with poor construction. When you wear a necktie, you want it to compliment your outfit, not dominate the conversation. As for the number of ties in a man’s wardrobe, I recommend three neckties for every suit. Classic tie colors include blue, green, reds, and gold while classic patterns are striped, dot, plaid, club, foulard, and paisley – start with simple solids and stripes; when you move past a half dozen ties in your wardrobe you can start purchasing brighter and more complex patterned neckwear. 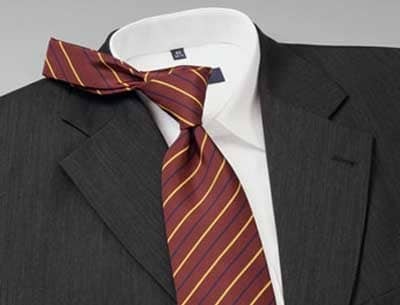 Here is a great guide on how to match a tie with a shirt and suit. The difference between a dress and casual shoe is the nature of the clothing that it is intended to be worn with. The types and styles of casual footwear are wide enough to fill a large book – in the dressier range are moccasins and both tassel & penny loafers. More casual options are Converse’s classic chucks and Timberland’s line of loafers and boat shoes; it’s important to note local climate and culture has a strong effect on what casual footwear is worn. Growing up in Midland the roper boot was the footwear of choice for many men working in the dry heat and dust of the Texas oil fields and ranches. Consider stepping a bit out of your comfort zone here. Don’t limit yourself to sneakers – saddle shoes are a bit dressier but infinitely more stylish and if taken care of will last decades and draw compliments. Instead of sandals, look at boat shoes which can be worn without socks and are more presentable than displaying to the world your dirty toe nails. 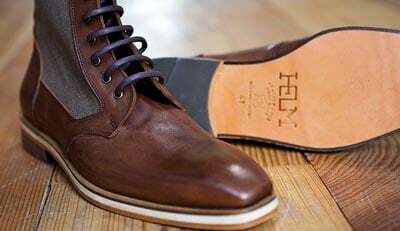 As with dress shoes, the number of casual shoes a man needs depends on his lifestyle. When looking for casual shoes for your core wardrobe, give more weight to muted colors that will never go out of style. Brown, beige, black, and occasionally navy and other assorted low tone colors are solid choices. The more it draws attention to itself with color, the harder it will be to match and wear more than a few times a month. Seek out quality and you can expect a long life from your footwear if you take care of it. When worn in conjunction with similarly styled clothing, it will look great today and over time develop a worn look that will make it look even better. 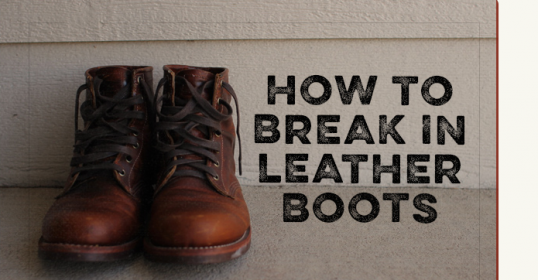 Finally, replace worn out footwear that is torn or permanently stained. Although casual footwear doesn’t have to have a shine like dress footwear, it should still be neat, clean, and presentable. Rotate your shoes, and store your unused pairs in a dry place where they can air out – this prevents mold growth and smells from developing. A pair of semi-casual boots I scoped out in Austin, Texas at the men’s store Stag on South Congress. Thanks for driving me there Eric! Your belt’s color and style should closely match the shoes you would wear with them – it’s very possible that a man with 4 pairs of shoes will need 4 belts. In fact, I recommend when you buy your shoes to buy a belt that matches while you have them in the store with you – you can always return the belt if you feel the current belts in your wardrobe are sufficient. As for matching, typically the thinner the band and the simpler the buckle the more formal the belt is. And always match metal with metal – monk strap dress shoes with a silver buckle should be worn with a thin belt with simple silver buckle. 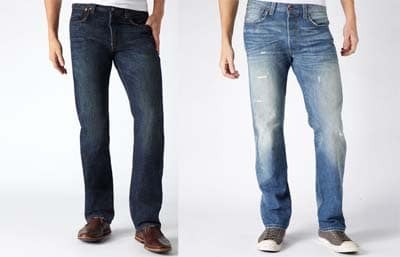 On the left we have denim you can wear with a sport jacket – on the right are jeans more suited to an untucked T-shirt. Jeans are arguably America’s greatest gift to menswear. They have come a long way from their humble beginnings as work trousers to their current iconic status as the trouser of choice for lumberjacks and movie stars. Equally at home with a T-shirt and sneakers or monk strap slip-ons and a blazer, jeans are a rare combination of image, functionality, and comfort. It’s these three traits as to why every man should have at least a few pairs of denim jeans in his wardrobe. By their very nature all jeans are casual; however, there are levels of separation and the darker the jean the more “formal” it becomes. Thus it’s better to mix a sport jacket with dark jeans than light jeans, although the latter can be pulled off especially in the summer. Anything with obvious signs of wear or holes should be reserved for more casual wear unless you have sold over 10,000 albums. What you own depends on your lifestyle and needs, but have at least two pairs that are dark and look sharp when worn with a dress shirt. For those tired of reading, here is a good article on understanding quality denim. Slacks, or odd trousers, come in a wide range of styles and fabrics and are differentiated from suit trousers as they have no matching jacket cut from the same cloth. The dressiest slacks, aka those suitable for wear with an odd jacket, are cut from a dark wool and styled in the same way suit trousers are. Once we start moving toward lighter colored fabrics cut from cotton we become less formal, with chinos being the most popular example. I advise most men to own at least one pair of dark wool trousers and one or more pairs of chinos in various colors. Chinos are dressier than jeans and an excellent option for warm weather. As for the wool trousers, most men are best served if when they buy a grey suit to purchase an extra pair of trousers as well. Because no matter how often I tell them not to, most men will wear their suit trousers as odd trousers at some point. Knowing this, it’s better to have two pairs, that way, when you tear or stain them, you will not have lost your whole suit. Distinct from the infamous short sleeve dress shirt, the button up dress shirt has a closer fit in the torso and often certain style features such as epaulets, double button patch pockets, and finished straight bottom so it can be worn untucked. It’s a fine shirt to wear on weekends or evening out in Vegas, but understand its limitations (and the limitation of all shirts worn without a jacket) are that they will draw attention to a large midsection. In general this shirt will move with trends, and it should be viewed as a fashion piece more than a classic item in the wardrobe. I like to have two in my wardrobe, one light and one dark. The polo shirt’s origin is in sport – developed by the great French tennis player René Lacoste out of the frustration he felt for traditional clothing on the court; it was later adopted by other gentlemen sports such as polo and golf. Today there are dozens of types and brands. When choosing one remember this hierarchy: Solid muted colors made from smooth and soft cotton or wool are the dressiest – patterned polos made from rougher cotton weaves are the most casual. While companies like Lacoste make polos appropriate for casual office wear, you’ll want to be careful wearing the polo you picked up for $5 at Old Navy to a business event. I recommend keeping your professional polos separate from your “play” polos, and stick with solid classic colors until you have a half dozen. Shorts are casual wear; there is no getting around this. Think twice about wearing them to any company event unless it involves sport, water, or a luau in Hawaii. Now I know many of you are thinking the author must be some type of stuffy old guy, but such is not the case; my point is that around the world shorts are not as accepted as they are US, and that they are rarely if ever acceptable when looking to make strong first impressions. With that being said, when a man wears shorts he should wear pairs that provide ample room in the hips and rise no more than 6 inches above the knee and never extend past it. Cotton and linen are great choices because of their fiber properties. Classic colors such as tan and khaki are two great colors to start with; be careful with white as it draws attention and stains easily. As for swim trunks, they are for swimming. Unless in San Diego, then you can wear them anywhere as long as you are never more than 5 feet from your surfboard. The two most important attributes of a sweater are fit and the type of fibers used in its construction. 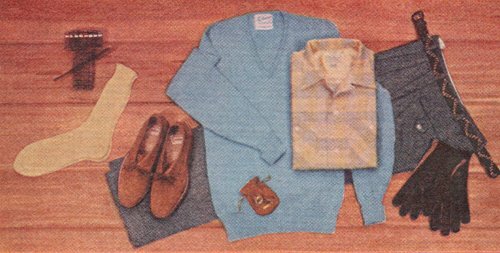 Color and style are important, but more so than other garments a sweater must be functional. As for the sweater types a man should own, this depends on both the climate he lives in and his budget. Men in living in cool regions are well served to own four plus classic sweater styles that they can wear into the office; men from warmer regions can get away with one or two they pull out when they travel. Finally, when selecting sweaters for your wardrobe pay very close attention to fit – altering a sweater is an art and most alteration shops won’t touch this type of high risk work. If a man is to own only one odd jacket, he cannot go wrong with either a classic navy blazer or wool sport jacket made from a dark solid or semi-solid fabric. Distinct style attributes such as silver/gold/brass/leather buttons, patch pockets, or a ticket pocket are key to signal the jacket is indeed not part of a suit. Navy blazers, because of their formal history and fancy buttons, are more formal than sport jackets and may not be the right choice for a man who rarely wears a suit – however they can be dressed down by ensuring they are single breasted and by selecting horn or mother of pearl buttons(a great summer look). Sports jackets on the other hand can range from sleek dressy worsted wool to more casual tweeds, and are a great compliment to a country living man’s wardrobe. I live in a rural town of 1000 people, and never feel out of place wearing my sport jackets and dress shirts with jeans. For more information about the strengths of the sports jacket, visit this classic AOM article. Next we’ll cover the often neglected parts of a man’s wardrobe such as how to incorporate hats, watches, & accessories along with clothing storage & protection. FYI, we read the comments so please suggest more ideas!